You guys, it's Halloween. Duh. Did you know that Halloween is probably one of my least favorite holidays? It's the straight truth. I don't like being scared. You know, haunted houses? Not my bag. Things jumping out at me? No thank you, sir and ma'am. Yet I like a show called Supernatural about hunting the very things that go bump in the night. Is this what you'd call irony, or just weird? Me and Benny, Benny and me, hunting together, twiddle dee dee. Anyway! Lest you think tonight's episode has anything to do with the actual holiday of Halloween, think again! This go 'round, we get to learn more about Dean and Benny's friendship, as well as Sam and Amelia's relationship. Sam, as usual, gets to do things like fix a air conditioner! A plugged up sink! An ice machine! Dean gets to kill some crap. Shades of season five episode "Free to Be You and Me" yessum? 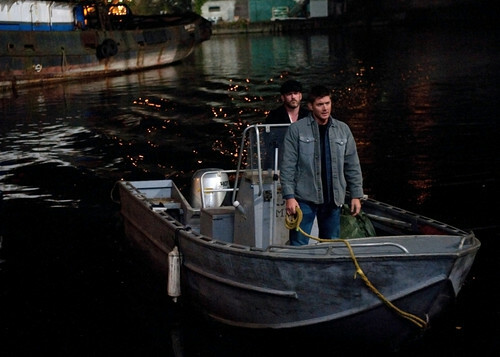 Dean and Sam have been tracking down Kevin. Or, rather, attempting to track down Kevin, because ole Kev is pretty good at throwing a tail. Honors students, we know what's up. Dean moans about it for a few before getting a call from Benny, who is in a spot of trouble after killing a bunch of his old vamp buddies, so Dean leaves Sam with only an explanation of "it's personal" to help out his Purgatory brother. Now, time was, if Sam had done something like that, Dean would've flipped his lid, and yet he gives Sam crap for being all WTF mate? I get it, conflict, yes, good, right, but sometimes... sometimes it becomes so old hat and samey. And now I shall shut up about that. 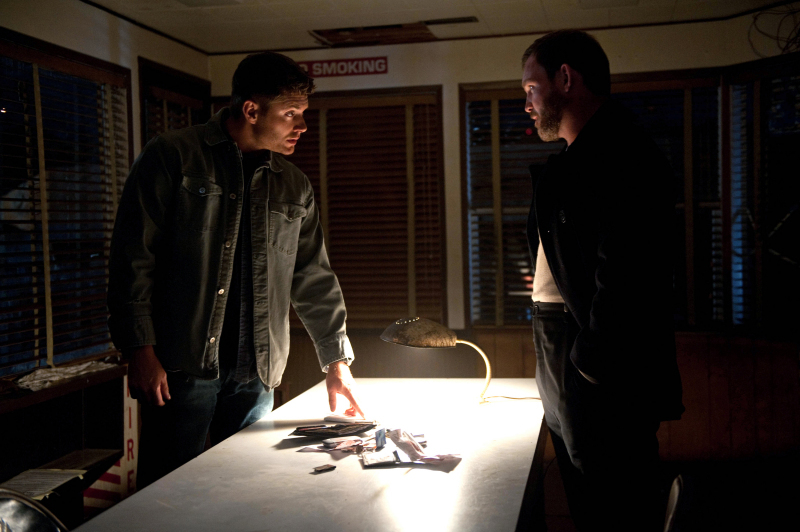 So, while Dean goes off to help Benny, Sam is left to his own devices, which means fixing a ceiling vent, which then sends him on a journey down memory lane. He helps out around a motel, runs coincidentally into Amelia again, because apparently there is only one motel in town and she is living in it. They banter, she's lonely, he's lonely, there's a dog. Meanwhile, it turns out that our friend Benny wants to track down his sire, who was the one who turned him, and also the one who killed him, all because Benny fell in love with a girl and wanted to quit the vampire pirate life he had been leading. Dean's ready to help avenge this injustice, as said sire also supposedly killed B's lady friend. I think we all saw it coming that she wasn't actually dead, though, right? They track the sire down, the lady friend is still alive, albeit now a vampiress, Benny is captured, but then eventually does kill his sire after much talking and talking about talking. He wants to get with Andrea and start a new life, but she's all into this current vampirate life she's got going on, which she can now be the leader of without the sire. B's not so happy with this idea, and lucky for him, he's got his hunting buddy to slice off her head, because surely he would not have been able to perform the task himself. But he's a vampirate! Oh hey look, a Star Wars boat. We also see some more glimpses of Purgatory, where the unlikely trio of human, angel and vampire were killing their way through the bleached our forest to find the gate back to Earth, though Benny and Cas are both less than convinced Cas will be able to get out of there, lacking humanity and all. They fight some Leviathan, Benny saves Cas, they're probably bro-bonding. Back at the docks, Sam has shown up. Right, because he and Dean had a lovely phone chat earlier wherein Dean spilled the beans about going on a hunt with a "friend." Sam immediately cottons on to the fact that Benny is not of the living variety, and boy does he look pissed at Dean about this turn of events. More bitching at each other to come, I'm sure. - Apparently, Dean is the only one allowed to have good guy friends. Cas, now Benny. Sam's had, uh... a dog named Dog? - So... the theory on how they get out of Purgatory is that they use Dean's humanity as the sort of vessel. Benny can hop on for the ride because he used to be human, but Castiel is screwed because he's always been an angel. BUT, he was possessing a human body, wasn't he? Did the human body disappear when he got pulled into Purgatory, and now he just assumes that shape because he's grown accustomed to it? I am probably thinking into this too much, but it's stuff like that that always gnaws at me. Logic! - The crack about Sam's sideburns...priceless. Dean: Kid's like Rain Man. He's like a crappy little credit card counting, criminal prodigy Rain Man. Sam: Well he was advanced placement. Amelia: I knew there was something off about you, with your creepy army navy, and your sideburns. 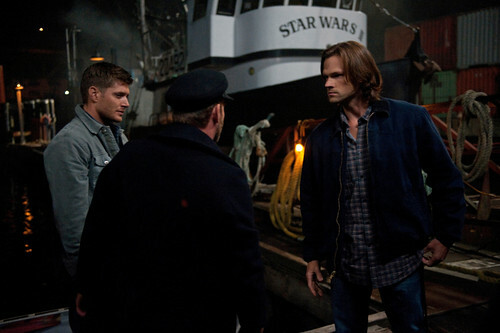 Dean: Vampire pirates, that's what you guys are. Vampirates. Dean: You don't know him. He's a friend. Sam: A friend. Dean, you don't have any--all your friends are dead! Dean: That's not what I called to talk about! Amelia: You came from nowhere, you're going nowhere, and you've, quote, "seen a lot of stitches?" It's all pretty solid creepy. I really enjoyed this episode of Supernatural and I can’t wait for the next one! This has been such a good season and I’m so happy with where it seems to be going. My coworkers at DISH even started watching the show, but they still need to catch up with season 7. Once they do, they can watch all of this season on my Hopper, since I’ve recorded every episode without having to choose it over my other shows. I think that once Amelia and Sam’s relationship gets explored a little bit more, there might be something we are missing about it!